Appréciation d'ensemble/ Evaluation : "... this recording is a must, not only for lovers of Handel’s music but of fine choral singing." This second volume in Stephen Layton’s and the Choir of Trinity College Cambridge’s survey of Handel’s Chandos Anthems is every bit as good as the first (reviewed in May 2009), with an outstanding solo line-up and compelling, razor-sharp performances. Handel’s first English anthem As pants the hart was written for the Chapel Royal in 1712 ; five years later he would expand it for the private use of James Brydges, Earl of Carnarvon and later the first Duke of Chandos, whose household he joined in 1717. Flush with funds after having been Paymaster General during the War of the Spanish Succession, Brydges had built a handsome Palladian mansion on his estate at Cannons; he had also assembled a group of resident musicians, part of whose role was to perform in services at the nearby St Lawrence Whitchurch (Cannons’s own chapel wasn’t finished until 1720). Handel would write 11 Chandos Anthems in total for Brydges (the first eight were written in contrasting pairs). All are psalm settings scored for soloists, choir and an orchestra comprising strings (no violas), winds (oboe and bassoon are mainstays) and organ continuo. The present recording includes As pants the hart, the later O come, let us sing unto the Lord, which features a pair of recorders, and I will magnify thee, O God, in all likelihood the fourth of the 11to be composed. Layton’s first Chandos volume featured the Academy of Ancient Music and superb soloists such as Emma Kirkby and James Gilchrist. Here, soprano Susan Gritton, tenor Thomas Hobbs and countertenor Iestyn Davies — who did feature on the first recording and a very much on-form Orchestra of the Age of Enlightenment join Layton and a c. 30-strong mixed choir. Following a light, buoyant reading of the opening two-movement sonata of O come, let us sing unto the Lord, the choir picks up on the latent energy and expands it in the title chorus, allowing Hobbs’s long tones to rest against a bed of recorders and violins in ‘O come, let us worship’. Layton’s stylish, energetic approach in the fugal ‘Tell it out among the heathen’ is another highlight here, as is Gritton’s smooth precision in the more fond passages of ‘O magnify the Lord’ and Davies’s firm, clear diction and attractive tone in ‘The Lord preserveth the souls of the saints’. Gritton is impressively affecting in the first solo of As pants the hart, ‘Tears are my daily food’, the opening duet of which for oboe and bassoon is also superbly rendered, while the dramatic chorus ‘In the voice of praise and thanksgiving’ shows not only Handel’s brilliant writing to its best advantage but the considerable dexterity of the singers and instrumentalists . The soprano and tenor duet ‘Why so full of grief’ is so artfully managed as to form a contrastingly gentle bridge to the final excitingly executed chorus, ‘Put thy trust in God’. 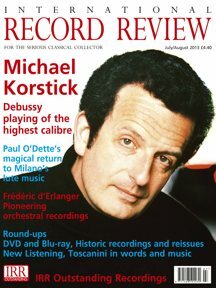 The recording concludes with the celebratory I will magnify thee, O God, in which the ecstatic chorus ‘I will magnify thee, O God’ , prefaced by a pastoral sonata, forms an impressive bookend with the elaborate ‘ Amens ‘ of the final chorus , ‘ My mouth shall speak the praise of the Lord’, to some particularly demanding tenor solos. Again, soloists, choir and orchestra are outstanding under Layton’s intelligent , stylish direction, allowing the surface details to sparkle against a fluid rendering of the basic architecture. 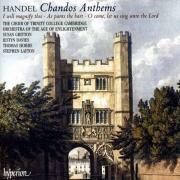 I’ve been a fan of The Sixteen’s complete survey of the Chandos Anthems (appropriately on Chandos) for many years. Layton’s offerings so far exhibit all of the former performers’ freshness and energy and none of their occasional imprecisions. Beautifully recorded and with excellent booklet notes by Graydon Beeks, this recording is a must, not only for lovers of Handel’s music but of fine choral singing.